Defending champions Zambia crashed out of the Africa Cup of Nations after a goalless draw with Burkina Faso, who progressed to the quarter-finals. It is the first time the reigning champions have gone out in the group stage since Algeria in 1992, when there were four groups of three teams. But Zambia deserved no more than they got as they failed to produce anything like the form that took them to the title last year - even though they leave South Africa unbeaten after three draws. In contrast, Burkina Faso have shown good moments - most notably their 4-0 demolition of Ethiopia - and finished top of the group on goal difference. However, neither Chipolopolo nor the Burkinabe covered themselves in glory in this final group match. In fairness, the shocking pitch in Nelspruit, which was covered in sand because a virus had affected the grass, caused big problems from the start. Players were losing their footing and it was obvious that the game was not going to be a classic. With the ball bobbling around all over the place and the players opting for long, hopeful punts up field, there was a total lack of control and a chaotic feel to the play. Add to that the pressure that both sets of players were under - knowing that this was a winner-takes-all match - it was unsurprising that there was a reluctance to try to get the ball down and play. And when the tournament's top scorer Alain Traore went off injured after only 12 minutes, it appeared things could hardly get worse - particularly as you feared Burkina Faso, without their star man, would adopt overly negative tactics to achieve the draw they needed to progress. Just minutes later, Zambia lost Davies Nkausu to injury and it appeared the teams may end the game decimated. As for any meaningful passages of play, Zambia had two chances to take the lead in the first half but squandered them both. Collins Mbesuma shot tamely at the keeper from an excellent central position inside the box and Rainford Kalaba headed an effort that was just as weak after the Burkinabe defence stood and watched a cross float to the back post. It would not be unfair to say that the sound of a fan periodically sounded air-raid alarm was the only menace in the stadium. It might have even served to wake some people up as the action was non-start. 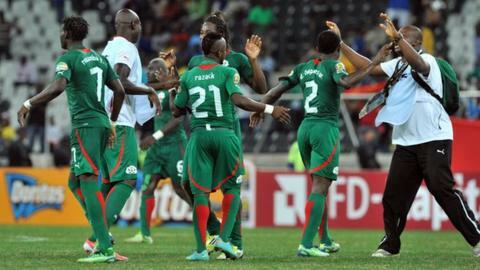 A second-half onslaught failed to materialise from Zambia as they gave up their title with barely a whimper. With no urgency in their build-up, no periods of pressure and no drive, their fate looked inevitable. And when they did finally create an opening, Mbesuma rose to meet a corner and headed woefully wide. Burkina Faso, content to play out a draw, threatened even less but they might have added further misery on Zambia had Jonathan Pitroipa made contact with a low cross from the right. As it was, Burkina Faso had done enough to make it through and Zambia's reign ended after a highly disappointing tournament for Herve Renard's men.